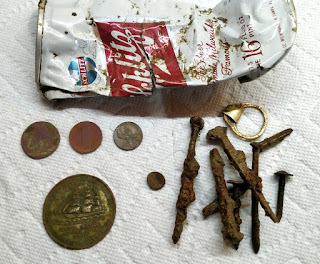 My first day of metal detecting I started my first dig on the site of a historic building on my Maine town property. My town was settled in 1638 an has a population of around 3100 today. The building dates back to 1837 and was the original Meeting House for the selectmen and other town business so I was hoping to find cool artifacts an old coins. I covered the whole lawn surrounding the building quite thoroughly by gridding it off. All I found were chunks of metal - probably from farm equipment and a few rotting clad coins. I may go back later and try again since many signals seemed to be quite deep. I went to historic farm house in town built in 1818 and started near it's entrance. I got a good signal right away and dug up a recent penny. But the second hole I dug won the prize. I saw it right away, a circular edge in the dirt that was way too big to be a coin. It was 45mm (1.75 inch diameter). 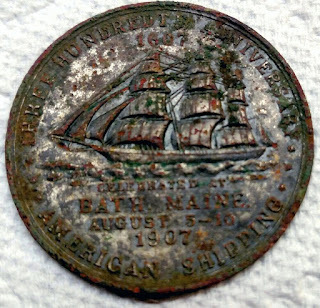 After cleaning it, I found that it was a brass or bronze commemorative medallion celebrating 300 years of ship building in nearby Bath. The full text on it reads: "THREE HUNDREDTH ANNIVERSARY AMERICAN SHIPPING 1607-1907 CELEBRATED AT BATH, MAINE. AUGUST 5-10". I later learned that it was made by Whitehead & Hoag in New Jersey and the medallion was likely silver plated originally. After I cleaned it up I sent a picture to the local Historical Society and offered it to them. I dropped it off a day or so later and they were thrilled to have it. I could not ask for a better first find. I continued to hunt for a few more hours and turned up a few more coins, a crushed Schlitz beer can, a pull tab and some rusty square nails. The pull tab was exciting because I thought it could be precious metal jewellery. They fool most detectorists because the equipment sees aluminum as gold or silver. PS, I wrote about this find for the August 2018 issue of Treasure Hunting Magazine (page 15).